This is an excellent example of an extremely rare trilobite. It is an unusual Saharops bensaidi from the Devonian of Morocco. This specimen was not prepared by Moroccans, it was prepared by Master Preparator Horst Burkhardt of Germany. This type of trilobite has three rows of vertical spines like its cousin, Comura, but the spines are shorter and pointier. The extremely fine bug is very 3-dimensional and wonderfully articulated. The snout has been prepared free-standing, and the long, pointed pleural and pygidial spines are beautifully displayed. The black, thick-shelled exoskeleton of the bug contrasts strikingly with the lighter-colored matrix. 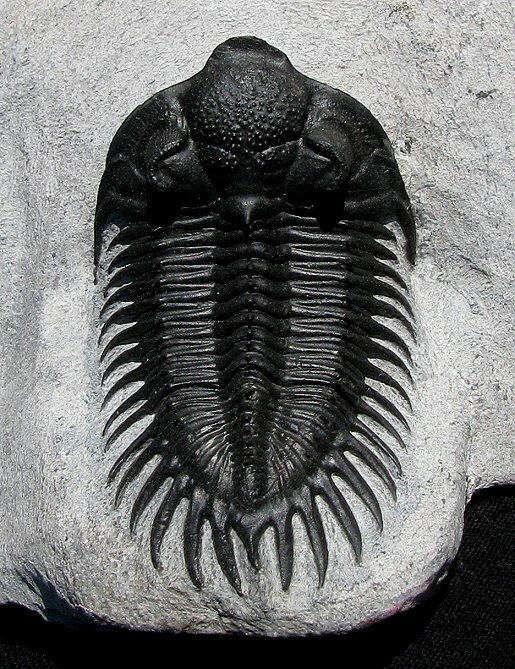 The spiny trilobite is well showcased on the sculpted block of dense limestone. This is a very collectible specimen of Saharops - one of the most detailed and best we have ever seen.